Scientists at NDSU have developed a monoclonal antibody that inhibits activation of the receptor for advanced glycation end products (RAGE). 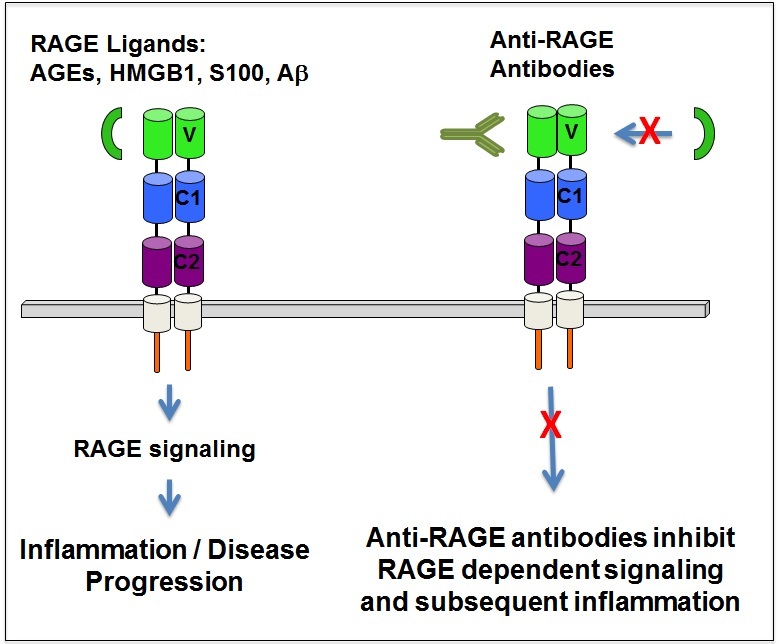 The antibody binds the V-domain to block activation of RAGE by its ligands. This antibody has delayed tumor growth in a xenograft melanoma model. The V-domain can bind multiple structurally and functionally diverse ligands to trigger signal transduction by RAGEs cytosolic domain, and results in sustained inflammation that is associated with diabetes, cancer, Alzheimers, multiple sclerosis, and other diseases. RAGE induced signal transduction pathways. Upon engagement with its ligands, RAGE stimulates the activation of a diverse array of signaling cascades, including mitogen activated protein kinases (MAPK), c-Jun N-terminal kinase (JNK), phosphoinositol 3-kinase (PI3K/AKT). RAGE also triggers activation of nuclear transcription factors, including nuclear factor NF-κB, and consequent target gene transcription. As a result, the anti-RAGE monoclonal antibodies have potential to treat a wide variety of diseases, and in some cases might reduce or slow disease progression. The antibody has been non-exclusively licensed to multiple licensees for research purposes, but is available for licensing for therapeutic and diagnostic purposes.